A controversial referendum to fund pre-k scholarships for low-income four-year-olds in Bartholomew County failed. Pre-K 4 All committee member Dave Barker and BCSC Superintendent John Quick wait for election results to come in Tuesday night. The referendum lost by a little more than 1,200 votes. 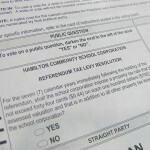 Fifty-four percent of voters said no to a property tax increase that would have raised $12.6 million over seven years. This marks the second time the ballot measure has lost – voters also said no back in 2012. The race was much tighter this time around. 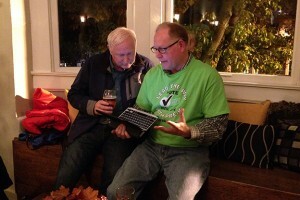 The margin of loss was just over 1,200 votes, as opposed to almost 2,000 in 2012. Bartholomew Consolidated School Corporation Superintendent John Quick says he’s disappointed in the outcome, but pleased that his community has started discussions about pre-k.
Quick and others say the issue felt different this year than in 2012. They cited a change in ballot language which allowed for a more precise description of what the tax money would be used for, as well as increased community outreach efforts had them optimistic for a win. Quick reminds area families that all hope is not lost – the county still has a number of private and faith-based pre-k options, as well as a handful of public preschools funded by federal Title I money. He adds that district officials will not “abandon” low-income children. BCSC leaders and community volunteers had been trying to raise money for scholarships at Busy Bees Academy in Columbus, a program that started five years ago thanks to financial support from a number of community organizations. Those groups originally committed funds for three years, extending to two more when the first referendum failed in 2012. With those funds disappearing in May 2015, district officials had said the future of what they call their own community pilot program hung in the balance of this referendum. Cummins, Inc. is one of the area’s largest employers and one of Busy Bees’ biggest donors. Jeff Caldwell, Executive Director at Cummins, says his organization will roll up its sleeves and try to help school leaders work something out. Caldwell says the group may need to rethink how creative they get about paying for pre-k.
“I think maybe its’ different financing, and that’s kind of a state-level challenge, because there’s not much available to us other than property taxes,” Caldwell says. How to pay for pre-k is a major discussion happening around the state. Groups in Indianapolis are looking for ways to support Mayor Greg Ballard’s citywide pre-k plan, and counties in the state’s pre-k pilot program continue to search for funds. On the statewide stage, Governor Mike Pence recently pulled Indiana’s application for a federal pre-k grant that could have meant up to $80 million dollars from the U.S. Department of Education.